Online registration is now closed. Registration is available at the event for $35 beginning at 7:00 am. Cash, check, VISA, Mastercard, and Discover accepted. Save time! Visit www.AllenEagleRun.org, print the Race Day Registration Form, fill it out, and bring it with you to the event. The start/finish and all activities will be held outside Eagle Stadium in the East (visitor) parking lot at 155 Rivercrest Blvd, Allen, TX 75002. 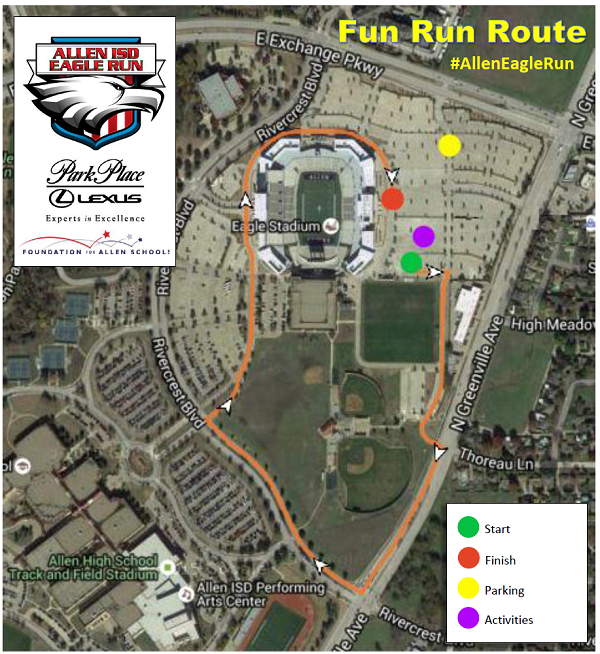 The Allen Eagle Run includes both a familyFun Run/Walk and a 5K Run. Also enjoy the festival-like sponsor area with samples and activities. 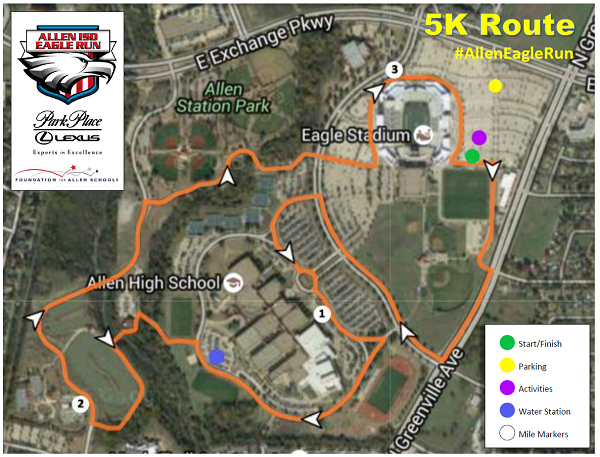 Now in our 11th year, the Allen Eagle Run is expected to host a crowd of over 3,500 participants!! Finish line management and bib tag timing provided by Compton Time and Measure. Creating opportunities for Allen ISD students and staff since 1997, the Foundation For Allen Schools provides funding for educational grants in Allen classrooms, scholarships for Allen High School graduating seniors, and tuition reimbursement for Allen ISD staff members working toward an advanced degree. Order with your registration and show your Eagle pride! Can't make it at the times above? Any race packets not picked up at the Allen ISD Administration Building or Allen ISD Service Center will be available to pick up at the run starting at 7:00 am at the Packet Pickup tent. What's in the Race Packet? The Race Packet contains the t-shirt, numbered race bib (with tracking chip for 5K entrants), Eagle Merchandise (if purchased), information, coupons, and items from Eagle Run sponsors. To keep the Allen Eagle Run fun and safe for everyone, we will have several corrals for the start of the 5K. There will be volunteers holding signs for each of these areas, please start in the appropriate corral so everyone can enjoy the race. Disposable electronic chip timing will be used at this event for the 5K Run only. All participants of Fun Run and 5K will receive a participation ribbon. The Fun Run is not timed and thus not eligible for awards. 8 and under, 9-10, 11-12, 13-14, 15-19, 20-24, 25-29, 30-34, 35-39, 40-44, 45-49, 50-54, 55-59, 60-64, 65-69, 70-74, 75-79, and 80+. When this page loaded, the official time was 2:18:28 AM EDT.